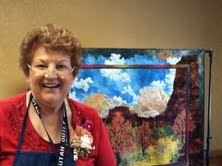 Last week I was busy taking classes at the Utah Quilt Guild Fest, an annual event which gathers quilters from all corners of the state to view wonderful quilts, learn new skills, mingle with national teachers, teachers who delight us with their work and impart their knowledge to help us grow in our craft. This was my third year attending Quilt Fest, and by far it was the best! There were so many great options for classes: Kim Diehl and her machine applique method, Anita Grossman Solomon teaching clever ways to use the rotary cutter to simplify blocks... and then, there was Susan McBride Gilgen with her wonderful landscape quilts. Additionally, we had a host of local quilters teaching various techniques. I chose to take four days of Sue Gilgen's classes, and I was blown away! It was very interesting to learn how she chooses a photograph and whether she replicates all elements in it or omits some of them, why it is important to make a rough sketch of what you want to represent with fiber, which fabrics work and which don't, and how we can enhance our composition using thread painting. My samples from the class will be used in the future to remind me of her advice and critique, so there is NOT A CHANCE you will be seeing any of my efforts... However, I already have a background fabric up on my design wall waiting to be turned into landscape. Sue Gilgen was featured as a luncheon lecturer last Thursday, when she showcased several of her award winning creations, talked about the process she goes through when composing a piece, and how her move from Wisconsin to St. George, Utah, has influenced her most current work. Check out GilgenArt to get a glimpse of what we heard and saw that day. As I stow away all the items from my quilt room which I took to the Quilt Fest, part of me wishes I were still in her class as I know there is so much more to learn... Learning is the best reason to go to quilt shows, as we absorb so much by taking classes or by admiring the gorgeous quilts on display. As you see from the Gallery on this blog, I am not yet (if I ever will be) loyal to a particular style of quilting. Although I have made half dozen landscape quilts so far, what I learned from Sue Gilgen will definitely have a positive influence in all aspects of my quilting endeavors. Thanks, Sue, for such inspiring classes!